The Guyana Energy Agency (GEA) is exploring the opportunities for using solar energy as an alternative to conventional street lighting powered by electricity from the public utility, Guyana Power and Light (GPL). The GEA posits that it is possible to significantly reduce the cost that the current street lighting systems occur with the use the use of stand-alone solar-powered street lighting and the use of light emitting diode (LED) lamps. “These lights utilize photovoltaic (PV) technology which harnesses the sun’s energy by converting it into electricity. The abundance of sunlight in Guyana, and the region at large, therefore makes solar-powered street lighting a very attractive alternative to street lighting powered by electricity from the public utility. The LED lamps also have an estimated lifetime that is five times longer than conventional HPSV lamps and energy savings of 80% or more” the GEA stated. 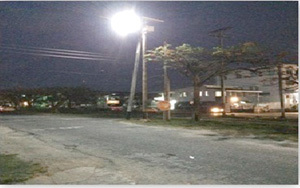 GEA’s engineers designed and with the assistance of Guyana Power and Light Inc. (GPL), installed one stand-alone solar-powered street light at the corner of Thomas and Quamina Streets in front of the Ministry of Amerindian Affairs. “The stand-alone solar powered street light consists of a 140W solar panel, 40W LED lamp, 105Ah battery, charge controller, timer, enclosure and mounts. This, the first unit installed by the GEA, cost G$278,300. It is estimated that these costs can be further reduced to about G$200,000 based on optimization of the design and lessons learned. 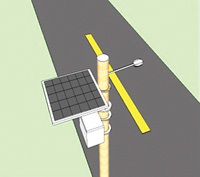 The estimated simple payback for the stand-alone solar-powered street light is about 3 years” said the GEA. According to the Energy Agency, apart from monetary savings, there are many additional advantages associated with the use of this type of street lighting. Given that it utilises the sun’s energy, the power generated is continuously available. During the sunlight hours, energy generated by the PV panels is stored in batteries; at nights when sunlight is no longer available the energy stored in the batteries are then delivered to the lamp. Additionally, because they use solar energy, which is renewable and sustainable, standalone solar-based, street lighting is environmentally desirable. GEA said it will continue to monitor research and record the performance of solar-powered street lighting. The information obtained from data gathering, and experience gained from the installation process, will be used to guide decisions with regards to street lighting. The body did say, however, that the Ministry of Works and Communication is responsible for any lighting of the national main roads, while Local Government organs are responsible for any lighting of local roads and streets. Category/ies:Guyana News, Guyana Projects, News, Projects.